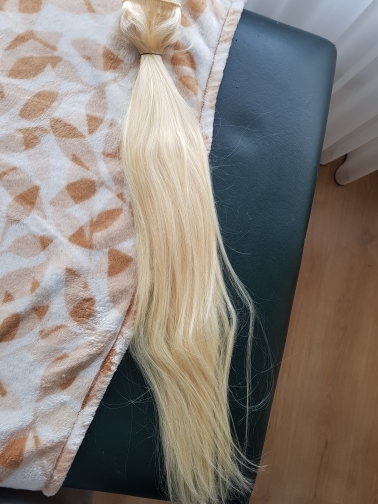 100% Real Natural Human Hair Used. No Synthetic, No Animal Hair ! Brazilian Real Human Hair ! Double Wefted, Tight, Neat ! Soft, Smooth, Gloosy, Silky, Straight ! Healthy To End, No Split ! Can Be Curled, Straightened, Can Be Dyed To More Darker Color ! If you have short hair, want long & Volume effect, Buy 2 lots please ! If you have long thinner hair, want Volume effect, Buy 1 lots Please ! Large Stock, Various of Colors in Stock ! Support Shipping within 24 hours after order pass verify ! Super fast shipping. Came in about three weeks. Never received it that fast before. Hair appears nice, but haven't truly tested it yet. Feels decent quality and soft but you never really know until you install it. I will try to come back with more feedback later. Great packaging. MRSHAIR Butterfly Series Silky Straight Human Hair Weaves 100grams Blonde Black Brown 16"18"20"22"